…well…my versions of cake at least…. Wow I really need to start getting more creative with the names of my recipes. NOTE TO SELF don’t just type out the ingredients and call it a title…hmm maybe I will brainstorm for this lil numba at the end of this post and you can tell me which you like best. Okay, enough with the chitter chatter as I have quite the treat to share with ya! One that quite frankly resembled and tasted like a cake (well according to my tastes). 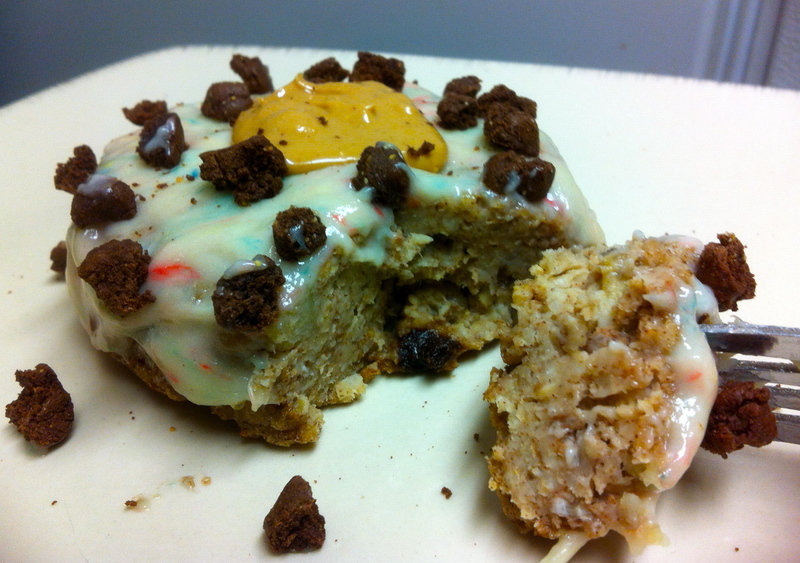 The lovely cake like icing (complete with girly sprinkles) was all thanks to my amazing tasting Cellucor COR-Fetti whey. Soooo worth the purchase and I would recommend this flavour to ANYONE ANYDAY. Cellucor my dear, I thought your cinnamon swirl and peanut butta marshmallow were awesome but this one really takes the cake. Pun intended. You really outdid yourself with this one! Yum. ANNNYWAYYYS I said enough chit chat didn’t I? Let that sit for about 10 minutes while you preheat your oven to 350 degrees. I normally soak my oats overnight to ease the digestability and nutrient extraction but I was making this whole thing the night before so I could only soak it for about 30 minutes. This step is completely optional OR you could stop the process here and place the mixture in the fridge overnight and bake it up fresh in the morning if you have the extra time. With the oven preheated, add 2-3 tbsp of water (or more milk) to your mixture to loosen it up a tad (as the oats will have taken in the majority of the liquid). 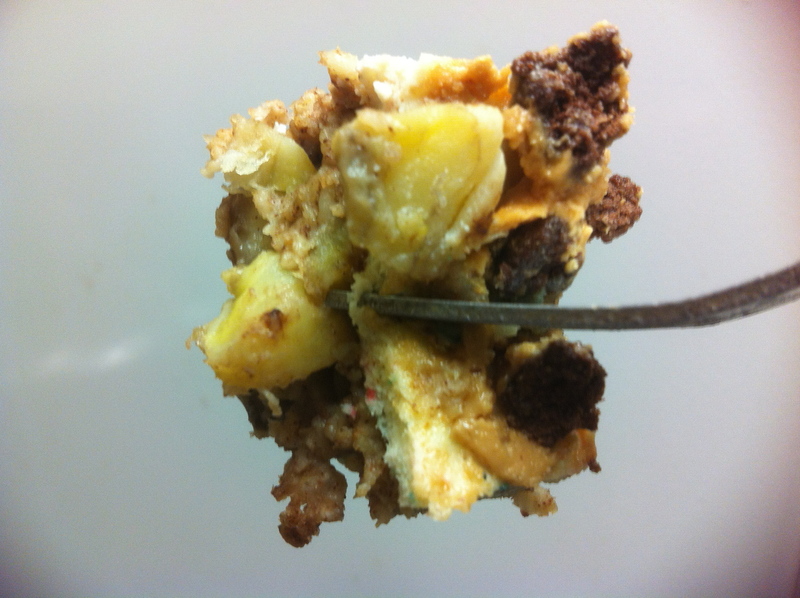 Fold some diced banana chunks into your mixture (I used 55grams). Pour your mixture into a sprayed foil cup or baking ramekin and bake in the oven for about 25 minutes or until the top is firm and the sides are beginning to pull away from the sides. If you are like me and making this the night before, when you wake up in the morning you can flip it out of the cup and place under the broiler for about 5 minutes (watch it for burning!) to crisp the top if you wish. If you are making it fresh, after it is done baking, give it a few minutes to set before attempting to flip it out of the cup or it may break. While your cake is broiling, combine the following in a small cup. Take your cake out and ice away. I chose to top my cake with more brownie Quest pieces so while my cake was broiling I chopped the remaining 1/8 of my brownie Questbar (if using, you will need 1/4 or more if you wish!) and threw that in my toaster oven to bake for about 2-3 minutes (at 350…watch them as they burn easily when they are rolled into lil chunks) while I iced my cake. Top with the baked brownie chunks and nut butter of choice (I used cashew) and NOM UP! There you have it. 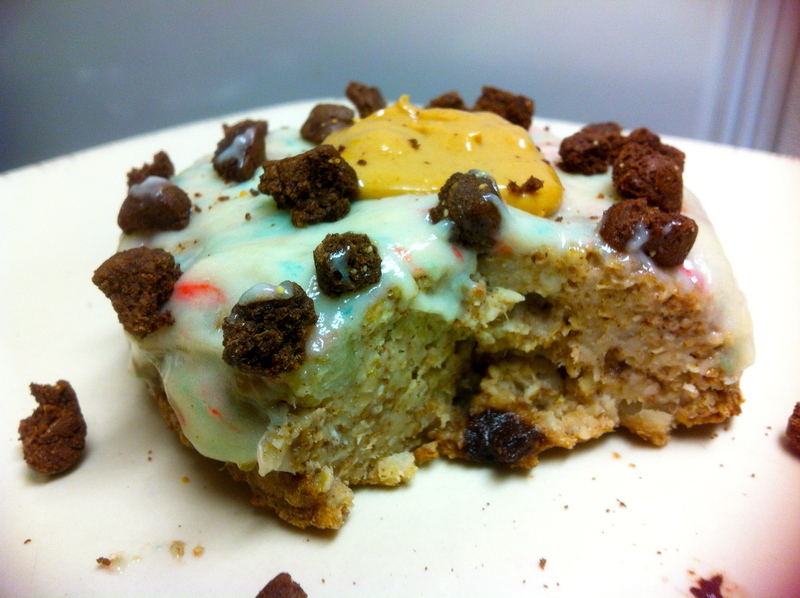 A tasty and healthy cake full of protein, healthy carbohydrates and fats to keep you fueled for your morning routine. Before I finish off this post, what title shall this cake be given that is better than the one I have used? Got better ones? Clearly my creativity button is broken. Have you tried the new Cellucor COR-Fetti high performance whey? Are you a cake fan in general? I can’t say I have ever really appreciated cake. If I ever actually had to choose a cake-like dessert, it would probably be my Mom’s homemade apple pie and that’s not even a cake. Never tried ice-cream cake though (darn lactose intolerance) so I can’t speak on that eye-gasmic sight. 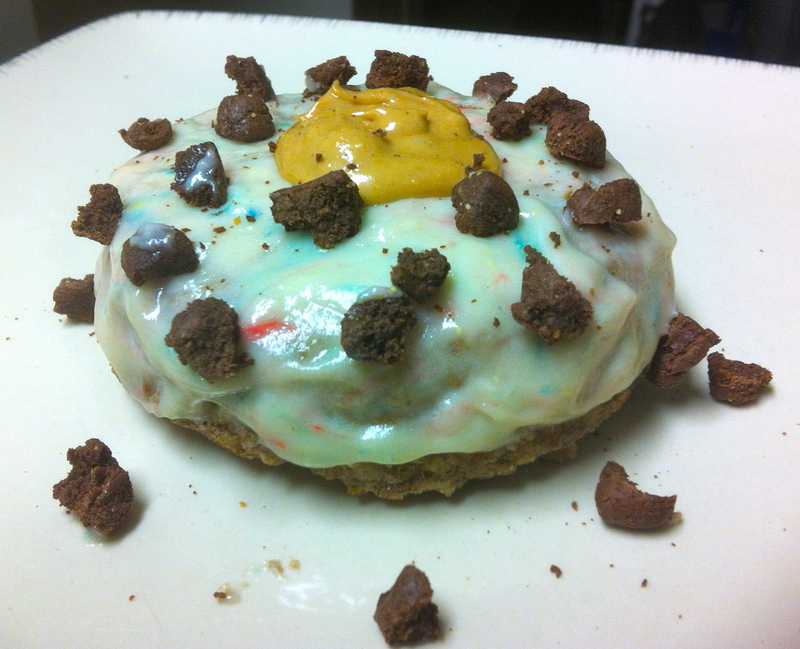 Categories: Recipe | Tags: Baked Oatmeal, Baking, Breakfast, Brownie Questbar, Cake, Cake Batter, Cellucor, COR-Fetti, Healthy Breakfast, Healthy Recipe Ideas, Oatmeal, Preworkout, Protein Powder, Questbar, Recipe | Permalink.